Mutual of Omaha Medicare Supplement Plans are popular all around the country, but before we get into the nitty-gritty of Mutual of Omaha’s Medicare Supplement Insurance, we need to know a little about the company and how they’ve become a solid force in the Medicare Supplement marketplace. If you would like to discuss a Mutual of Omaha Medicare Supplement Plan please call 844-528-8688. Keep reading for details on Mutual of Omaha Medicare Supplemental insurance plans. Mutual of Omaha was founded in Nebraska back in 1909 and named a gentleman by the name of Harry S. Weller who served as the company’s first president until 1932. From 1909 until today, the company’s growth has been continuous and profitable due to the company’s conservative attitude and it’s acquisitions. It did not take long for the company’s name to become commonplace as a result of continuous aggressive advertising campaigns and its affiliation with the Wild Kingdom television show. Many people remember Marlin Perkins as the show’s host until he passed away at the age of 81. United of Omaha Life Insurance Company – United of Omaha handles various insurance products like annuities, Medicare Supplements, and other financial products. United World Life Insurance Company – Specializes in Mutual of Omaha Medicare Supplement Plans. Omaha Insurance Company was founded in 2006 and also offers Mutual of Omaha Medicare Supplement Plans. Companion Life Insurance Company – Companion offers life insurance in the state of New York for individuals and groups. Mutual of Omaha Investor Services – This is a broker-dealer that provides mutual funds directly to consumers. Omaha Financial Holdings – This is a holding company set up to oversee Mutual of Omaha's banking services. Mutual of Omaha remains proud of its solid foundation that is the cornerstone of the company's commitment to being there for their customers and employees. The company continues to enjoy solid ratings from all of the national rating services. If you’re reading this article, we assume that you have Medicare now or will signing up soon and you’ve probably found that there are considerable gaps in coverage because of deductibles, copays, coinsurance, and coverage gaps. Purchase supplemental insurance to fill in the gaps and reduce or eliminate your health care costs. For most people, there is no monthly premium for Medicare Part A. However, if you did not pay enough Medicare taxes while you were working, you could end up paying $422 per month for coverage. Although most patents spend less than 60 days in the hospital for one benefit period, can you imagine your costs if you were hospitalized for more than 60 days? Depending on your annual income, the standard monthly premium for Part B is about $130 per month. The Part B deductible for 2018 is $134 (it could be higher depending on your income). After you’ve met your deductible, you are responsible for 20% of all Part B covered services provided by doctors, specialists, outpatient therapy, and Medicare approved medical equipment. You are also responsible for 20% of doctor’s services while you are an inpatient. Regretfully, many people are guilty of thinking “20% isn’t that much.” They are right if they are thinking about one doctor visit a year. But for many seniors who are dealing with multiple health issues and are getting care from multiple physicians, 20% of the annual cost of healthcare can become financially devastating. You can mitigate (there's that word again) that risk by purchasing affordable Mutual of Omaha Medicare Supplement Plans and have peace of mind knowing you can afford the unexpected. 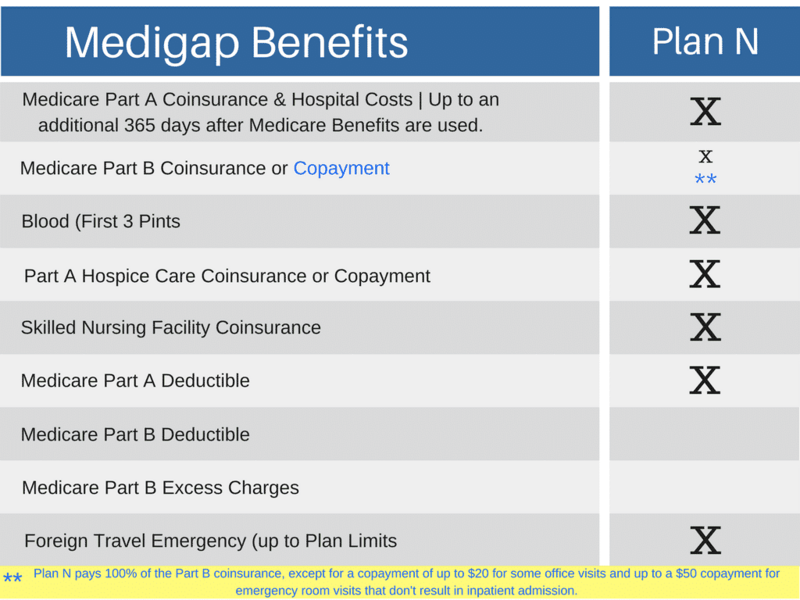 Below is our comparison chart for Mutual of Omaha Medicare Supplement Plans. The plans that are available to you depend on your state of residence. The pricing for each plan also depends on where you live as well. 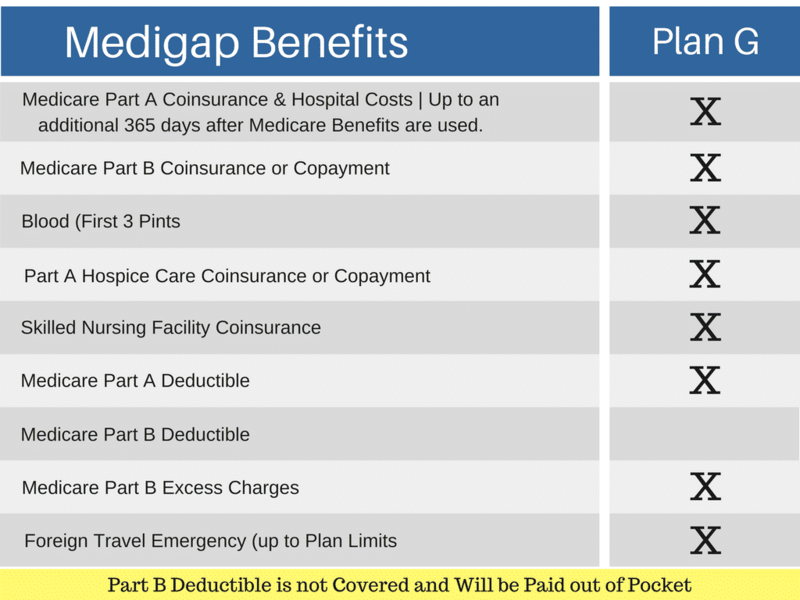 By reviewing this 2018 Standardized Medicare Supplement Plans Chart, you can get a very good idea in advance which plan is most likely to meet your coverage needs. Then you can contact contact us and find the company that best meets your needs price-wise and make policy arrangements online or over the phone. It’s important to note that although the plans listed on this comparison chart are available in almost every state, Massachusetts, Minnesota, and Wisconsin have different standardized plans that are approved in their state. These three states standardize plan selection with a base plan and a series of riders you can add. You can follow the links for each state to find the information on each state’s approved Medicare Supplement Plan. 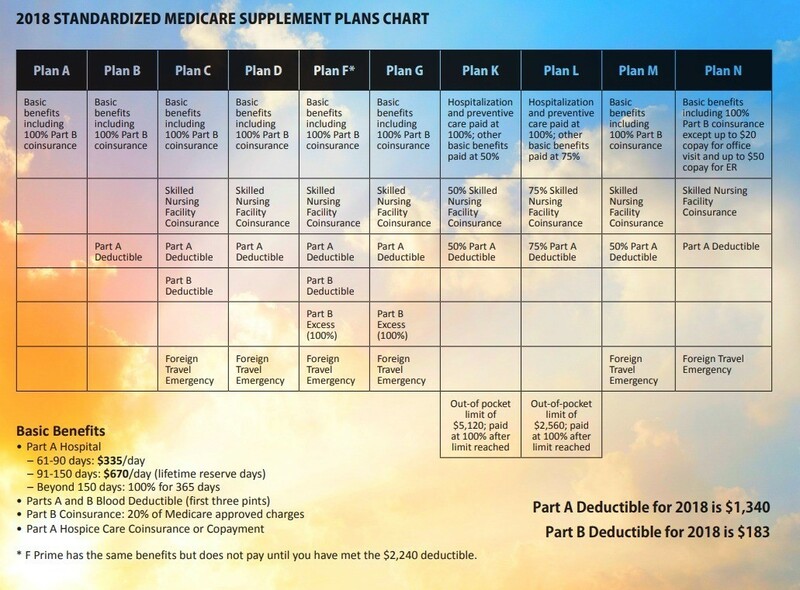 Medicare Supplement Plan G, is one of the most popular plans on the market today. Plan G combines lower premiums with unbeatable coverage. With a Mutual of Omaha Medigap Plan G you can rest assured that your Medicare Supplemental Insurance is well taken care of today and long into the future. The Medicare Supplement Plan N is one of the lower cost Medicare Supplement Plans and is designed to keep cost low by you paying a copay when you go to the doctor or the emergency room. The Plan N does not cover the part B Excess charges, but if you make sure your doctor accepts Medicare Assignment or you live in one of the states that does not allow the excess charges, a Mutual of Omaha Medicare Supplement plan N could be a great fit for you. Need Help Choosing a Medicare Supplement Plan? You can enter your information on the quote tool on this page or call us anytime 844-528-8688. There is never a fee for our services and we carry all the top providers of Medicare Supplemental Insurance in your state.